Purchasing a vehicle that checks off all your organization’s needs/wants within your budget can be a challenging and lengthy process. There’s an endless list of customizations and factors to consider. 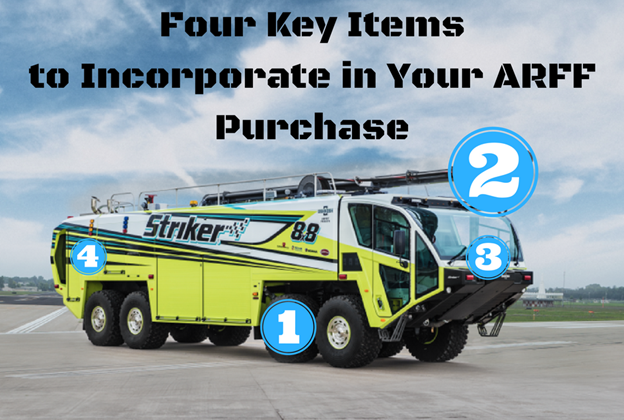 Here are four items to include in your ARFF purchase to obtain the best tools for your mission. 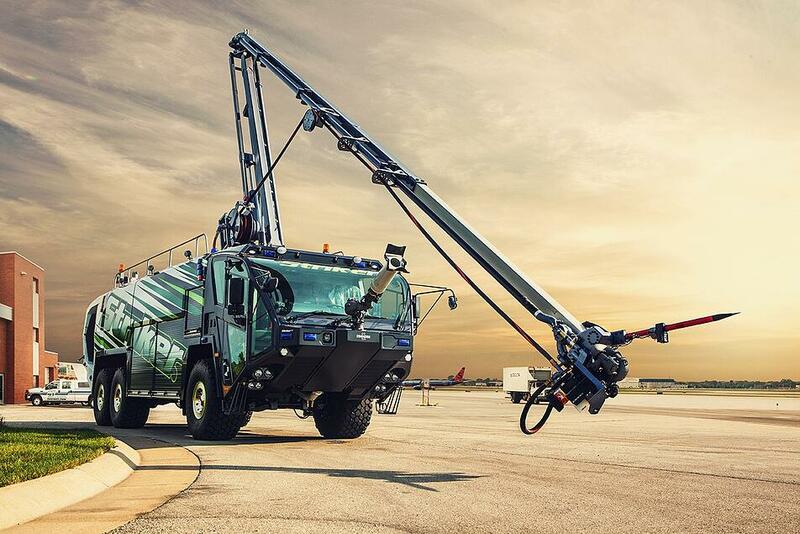 Any ARFF vehicle is built with the mindset of durability and safety. Operators, specifically in aircraft emergencies where terrain is often an obstacle, face the common problem of bump steer. Bump steer can occur when your vehicle does not have an independent suspension, causing the wheels to react to road conditions adversely, effecting steering. When one wheel hits a pothole, the other wheel reacts in a way that causes the steering angle to change. This can be a huge safety hazard, especially when human instinct in these types of situations is to over correct. Worrying about how your vehicle might react to terrain causes emergency responders to slow down; ultimately increasing the amount of time it takes to respond to an incident. 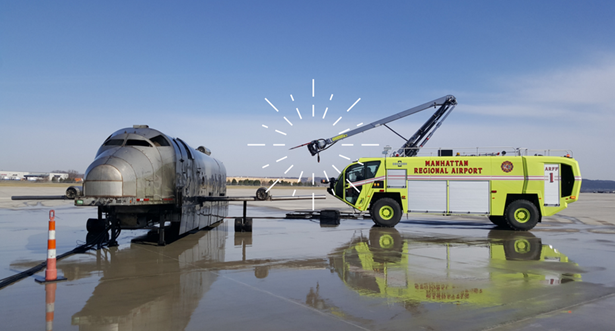 Independent suspension is a key item to incorporate in your ARFF purchase. Each wheel has its very own shock absorber and spring, allowing each wheel to react to its very own unique road condition. This equips you truck with the necessary tools to attack any off-road terrain your team might encounter during an emergency. 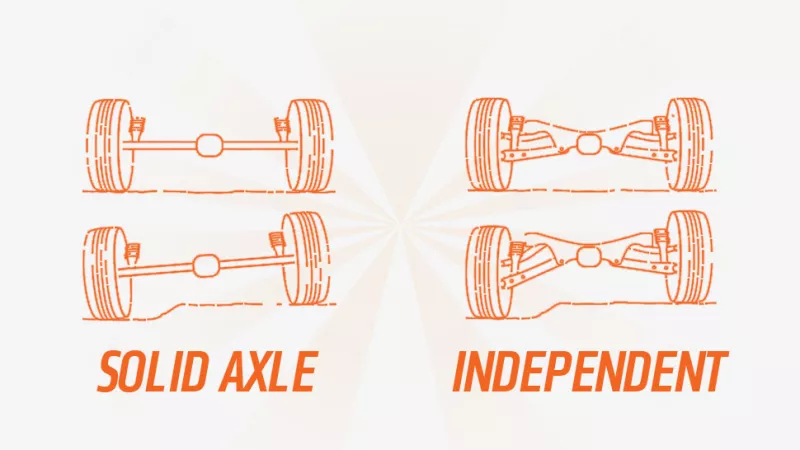 Not only is an independent suspension safer and faster, it allows for a larger range of movement, which in hand, improves steering through shortening the overall turning circle. This might not seem important, however, shortening the overall turning circle allows the operator of the vehicle to respond quicker to external conditions by having greater control over steering. Once again, safety should always be every buyer’s number one concern. The HRET is a phenomenal device that allows emergency responders to attack fires from afar while coincidingly providing an elevated water source. In situations where a New Large Aircraft (NLA), such as a 747 or an A380 designed with two floors of seating, a HRET provides access without risking the possibility of the aircraft collapsing on emergency responders or even worse, trapping them. Rather than sending your people inside an aircraft, a HRET has thermal imaging technology to pinpoint exactly where the source of the fire is located. Once detected, the HRET can pierce through a wide array of materials all while being minimally invasive. This simple process allows easy access to the emergency site and gives responders the option to disperse the proper fire agents. Simply put: the lives of your firefighters and the passengers they protect are far more valuable than the cost to repair an incision by a HRET. Common fire emergency practices recommend attacking a fire threat from the base with a swaying side-to-side motion; inventing the need for a Low Attack Bumper Turret. Landing gear fires—the most common fire related emergencies for aircraft—most often happen when an aircraft has hot brakes. Depending on the overall weight and speed at which the aircraft is moving, the degree of friction absorbed during this process can cause a fire. The less friction absorbed increases the chances of a fire emergency happening. The most efficient airports in the world recognize their responsibility towards our environment. Leading airports understand the importance of using products in their airport that leave the smallest carbon footprint all while getting the job done. It is important to diligently pick an engine for your ARFF truck that is clean, sustainable, and responsive to any emergency. Engines compliable to EPA Tier 4 Final standards contribute to the common goal of lowering exhaust pollutants PM (particulate matter) and NOx (oxides of nitrogen). Tier 4 Final engines provide better fuel combustion, improved fuel economy, and greatly reduce the amount of particulate and gaseous pollutants. Compared to older engines, there’s a significant reduction in NOx. On top of the positive environmental attributes, following Tier 4 Final standards builds your airport’s brand image and reputation. People follow companies with an initiative and purpose. Simply by being a critical engine shopper, you can contribute much more to our environment and your airport’s image than you may realize. If possible, you want to avoid purchasing an engine with a Diesel Particulate Filter (DPF) while still meeting clean emissions standards. Filters call for a lot of upkeep, which can reduce uptime. 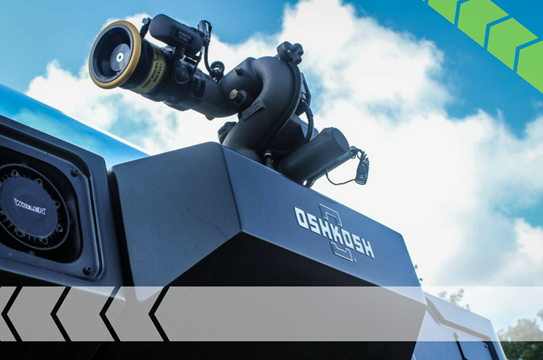 The customization of your ARFF truck is limitless. However, building a vehicle that is sustainable, safe, and accommodating to your organization’s financial means can be challenging. After thoroughly analyzing the benefits of these four items, we hope to help shorten the decision-making process ever so slightly.